The Brewster F2A (company Model 139) was an American fighter aircraft which saw limited service during World War II. In 1939, the F2A became the first monoplane fighter aircraft used by the US Navy. In December 1941, it suffered severe losses with both British Commonwealth and Dutch air forces in South East Asia while facing the Japanese Navy's A6M Zero and the Japanese Army's Nakajima Ki-43 "Oscar". It also saw action with United States Marine Corps (USMC) squadrons at the Battle of Midway. 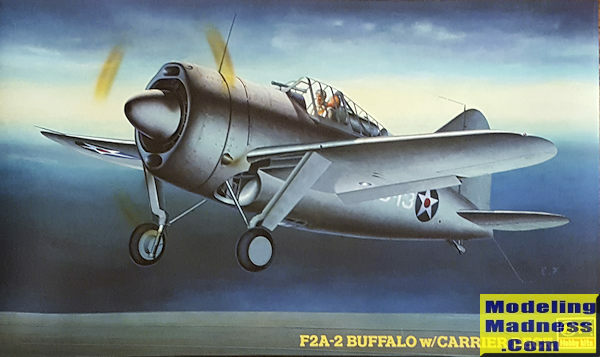 Frustrated with the Buffalo's poor maneuverability and speed compared to the Zero, the F2A was derided by USMC pilots as a "flying coffin". However, during the Continuation War of 1941-1944, the Buffaloes operated by the Suomen Ilmavoimat (Finnish Air Force) proved capable of engaging and destroying most types of Soviet fighter aircraft operating against Finland at that time and achieving, in the first phase of that conflict, the outstanding ratio of 32:1, 32 Soviet aircraft shot down for every Buffalo lost. The F2A is not one of those kits that has seen a lot of plastic in 1/72. In the past, both Matchbox and Revell have released this aircraft, and while both can be made into nice models, neither of them would be considered to be cutting edge. Even this one is over 20 years old, but is quite nicely done. The kit has a fairly nice interior with a proper control stick and rudder pedal assembly. It also does not have a proper floor, just like the real plane so the pilot can see out the window on the bottom of the fuselage. 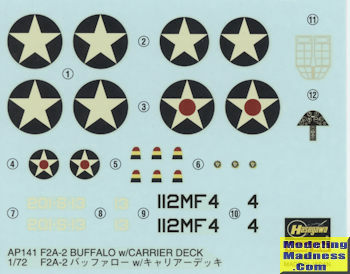 Also typical of Hasegawa 1/72 kits, it has a decal for the main instrument panel. It does have a separate sliding canopy, but it looks as if the plastic may be a bit too thick to properly display it open. Since these are the USN/USMC versions, one will need to open up holes for the life raft. Hasegawa does offer a -1 kit and so there is a separate sprue for the forward cowling. This kit only makes the -2. One will also have to open up the separate tail cone piece to be able to use the tail hook. For the underside of the fuselage, there is a window piece with its own frame decal so you don't need to be concerned about painting this feature. Just be sure to apply the decal after the kit has been painted. The engine cowling is four pieces with the forward section a single piece. There are parts that will not be used such as a metal plate for the window piece and a tail wheel part with a protective housing along with uncuffed props. The major attraction o f this boxing is a two piece flight deck assembly. This is larger in all dimensions to the finished model so will make a great display area. Instructions are typical Hasegawa with Gunze paint references. There are two markings options, both post yellow wings. One is the box art plane in overall light grey for which Hasegawa recommends 36440 light gull grey. It is listed as being with VS-201. The other is from later in 1942 after the red center has been removed from the insignia. It is blue-grey over light grey and listed as being with VMF-2, though I image it is really with VMF-112 based on the fuselage codes. Decals are well printed and despite their age, should work well. I am not sure how available this particular boxing might be, but I've had this kit for nearly 20 years and only opened the shrink wrap to provide you this article. If you have a collection of 1940s USN planes, then this is one that really needs to be in your collection.